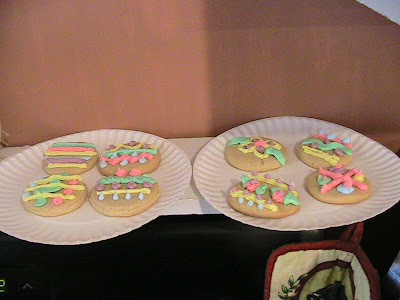 Here are a few of the Easter Cookies that we made. They are a peanut butter sugar cookie recipe, with frosting. 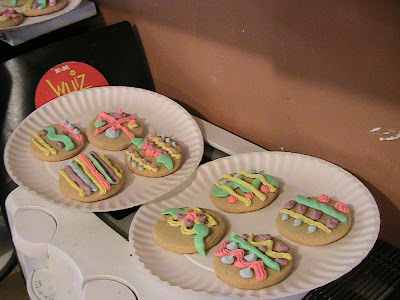 I made up 5 frosting bags, and let the kids each decorate 2 cookies. Most just licked the frosting off, but a couple of the kids put their cookies together and ate them as a sandwich! Silly kids. These are the cookies that we're giving to the boys' teachers tomorrow. Mrs LeGrand, Mrs. McReynolds, Mrs. Kump, and Tom's other teacher. Aren't they pretty cookies! 1. Mix together powdered sugar, egg, margarine, peanut butter, vanilla, and salt until smooth. 2. Slowly add flour and baking soda while mixing. 7. Cook for 7-8 minutes (mine took 11 minutes) until edges are only lightly browned. Cookie will remain light in color. 8. Cool on rack for 5-10 minutes. Store in airtight container up to 2 weeks. I didn't even get to try one. Stupid diet! nice cookies Sweetie...I'm sure they are not worth busting your diet for! After all, it is just sweet sugar...never as good as it looks! These look really nice..and thanks fr sharing the recipe...it's great to see the Easter spirit everywhere...and well for some more fun and spirit of Easter do drop by my blog on Easter Wishes sometime and enjoy all that i've posted there!!! !